What is robotic heart surgery ? Robotically-assisted endoscopic heart surgery is aimed at making endoscopic heart operations feasible. With this technology, the surgeon manipulates the surgical instruments with the help of a computer. An endoscope is passed through a tiny incision in the chest wall, and two surgical instruments are passed through additional tiny incisions. The surgeon views the image provided by the endoscope on a computer screen. Instead of manipulating the surgical instruments directly, the surgeon manipulates them via a computer console - similar to manipulating a gamepad to play Ninetendo. 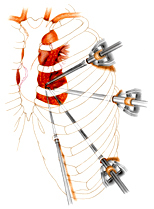 The computer interprets the surgeon's hand movements and causes the surgical instruments to respond accordingly. This system addresses the major disadvantages to moving the long surgical instruments manually - computer control of the surgical instruments essentially eliminates the tremor effect, and also the non-intuitive feel of maneuvering such instruments. How is robotic heart surgery being used ? What are the advantages of robotic heart surgery ? What are the disadvantages of robotic heart surgery ? Another disadvantage is the expense of the robotic systems. They cost between $750,000 and $1,000,000, and it is unlikely that most hospitals will be able to afford purchasing the robotic systems for operations they are performing "just fine" today without the robotic equipment. The bottom line: it is likely to be several years before robotic heart surgery is widely available. What controversies surround robotic heart surgery ? Not all surgeons think robotic surgery is a great idea. 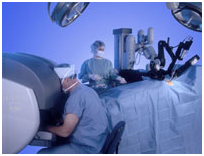 While most agree that robotic surgery is feasible, many question whether it should be pursued at all. They cite the expense of the equipment, and the success they are currently having with today's methods of doing surgery. Such arguments against new technology date back at least to Gutenberg, of course, and are easy to counter. One suspects that those surgeons betraying a Luddite opinion might have other fears in mind - such as a complete disruption of the practice of surgery. It is easy to ask why, for instance, if a surgeon can perform a heart operation while sitting at a console 15 feet away from the patient, then why couldn't that surgeon perform the same operation while sitting 1500 miles away from the patient? In other words, competition for patients would occur on a global scale instead of a local scale. (And everyone could be operated upon by only the very best surgeons.) If such a notion does not disrupt the practice of surgery, DrRich doesn't know what does. What surgeries can be performed using the robotically assisted heart surgery technique ? When a patient has heart failure, often times the right and left ventricles do not pump together (dysynchrony). When the heart's contractions become out of sync, the walls of left ventricle (LV) do not contract at the same time. The heart has less time to fill with blood and is not able to pump enough blood out to the body. This eventually leads to an increase in heart failure symptoms. Robotic surgery can be used to place left ventricular leads on the surface of the left ventricle. 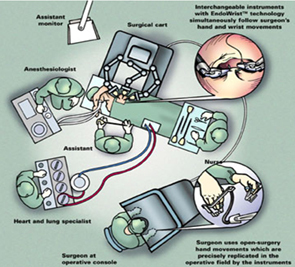 What are the benefits of robotically assisted heart surgery ? Penn is one of the few hospitals in the country to have a surgeon on staff specially-trained to use the robotic system for bypass surgery. A wide range of surgical options, from traditional, open-heart surgery to less invasive robotic surgery is available at Penn. Each bypass procedure is customized to meet the patient's individual needs and condition. In the operating room, one surgeon controls the robotic system, while a second surgeon works alongside the patient, making the tiny chest incisions for the robotic arms and camera. With the high-resolution, three-dimensional camera system, the operating surgeon has a full view of the patient's heart and can perform the bypass operation with the multi-jointed, robotic arms. This minimally invasive approach results in less trauma, blood loss, pain, scarring, and lower risk of infection, while improving recovery time.In addition to bypass procedures, the robotic system is being used for heart valve operations and will soon be able to assist with aortic procedures and the treatment of heart failure and rhythm management.